After all these questions had been asked and criticisms advanced, it was demanded that Edhem Bey and his brothers should be par doned. During all the sittings of the 29 th December and some of the secret sittings of the 30 ta , I put forward explanations. I endeavoured to describe the situation as it was in its full reality, supporting my statements by irrefutable documents and proofs. In spite of all I said, the discussions continued. Without taking anything else into consideration, the telegram with the objection to the lawful cha racter of the Assembly was sufficient in itself to bring the law con cerning treason against the country into operation against these rebels, and yet nobody seemed to remember the fact that they had taken up this mutinous attitude for many a month, that they had re solved to carry out their plans with the object of overthrowing the national government and to form another one to suit their own plans _ indeed, it even seemed that the attempt was made to relieve them from submission and punishment. Let me tell you why this was so. Some deputies thought that the situation was the result of personal friction and of temperament. Lively propaganda to this effect had actually been spread to mislead public opinion. Due to exaggerated fancies, they imagined that Edhem s forces were considerable and difficult to reduce to submission, that in case of an encounter with them the regular army would flee in every direction, and that in that case the position would really become tragic. With this idea it was thought right to prevent them from coming into contact with one another. 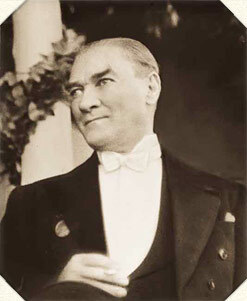 Is it possible not to observe that to adopt such a point of view and to act on such lines would have meant the surrender of our whole Turkish country to the dictatorship of this Edhem, who had been nothing better than a dispatch rider and whose mental faculties were equivalent to those of one? After we had spoken in a manner that was calculated to allay the excitement and doubts of the Assembly, we concluded our discussions in the secret sittings in the anticipation of actual events. Our troops who were following Edhem Bey s forces occupied Godos on the 5 1 * January, 1921, and consolidated themselves in this district. Edhem Bey and his brothers with their force occupied the most suitable position for them, namely in the ranks of the enemy. The “Affair of Edhem” no longer existed. This latter enemy who was born in the bosom of our own Army was expelled from it and had been pressed back into the enemy s front.